Sweep the leg is the sort of pop culture reference that makesÂ my generation smile. The boys and I use it both in jest and without, but I never thought that it would be used at my daughter’s soccer game. That not just because the dark eyed beauty is 7.75 going on 30. It is because the league is for 8 and 9 year-old girls. It is supposed to be a place where the girls can have fun, learn how to be a part of a team and get the kind of exercise that video games can’t provide. Most of the time the games really are nothing but fun, competitive but fun. But yesterday things got ugly. Yesterday the coach on the other team told his girls to sweep the leg. Ok, I didn’t hear him say that but his team of pig tailed cut throats was out for blood. They pushed, kicked, shoved and tripped our girls with reckless abandon and unabashed enthusiasm. If you know me in real life you know that I play a very aggressive game on the field/court. I like the contact and I don’t mind banging into people or being hit. It is part of the game. So I told the girls to defend themselves. I told them that they were not to try and hurt the other team but that they couldn’t allow themselves to just be pushed around. And then two of our girls went down hard and parents got angry. I did too. It was unnecessary. I reiterated again that we weren’t there to retaliate but that we weren’t punching bags either. In the interim things started to get ugly. The parents from the other team started trash talking and their coach told us to “get over it.” Words were exchanged and I began to wonder if things were going to wind up in a very dark place. That made me very angry. There is no reason for that kind of talk or behavior, especially at a soccer game for kids. I heard two of the fathers on their side start talking about who on our side needed to get their asses kicked and Â I positioned myself just behind them. One of the other dads from my daughter’s team wandered over and told me that he thought I should stay out of it. I laughed and told him that I wasn’t going to throw the first punch, but I wasn’t going to let them do it either. He said it wasn’t worth getting hurt and I told him that my kids weren’t going to witness a meaningless brawl on the side of the field. He asked me how I would stop it and I told him that if necessary I would sweep the leg. He laughed and I asked him to stay with me just in case something happened. Â “I am not as big as you are and I don’t want to get hurt.” I shook my head at him and explained that it was unlikely he would. All we needed to do was stand in between the angry parties and calm would be maintained. My less than eager “peacekeeper” told me that I was doing a hell of a job of maintaining order. I smiled and said that some people just need a reminder that others are watching them. The whistle blew and the game ended without fists flying. Several of our girls were in tears and there were still very angry parents buzzing about the edges of the field. More words were exchanged between them but fortunately nothing happened. One of the moms on the other side made a crack about our girls being wimpy and I responded by telling her that nobody likes the mean girl and that mean moms are liked even less because junior high ended a long time ago. I wasn’t surprised to discover that she was the coach’s wife. It really was a sad experience and a sad commentary about a lot of things. It is just a game. Â My daughter is unaware of what happened between the parents on the sidelines so I am grateful for that. Sometimes people are just peachy. This is what you call a partially recycled post. Hard to believe that it has been three years since I first wrote I Am Still A Ga-Ga Master. The game is tied into a family trip that is a hell of a lot of fun. This was Little Jack’s fourth time around and you could see that the years have been good to him. The little boy isn’t quite so little anymor and has learned numerous tricks. He spent quite a bit of time trying to beat me, but only managed to do so once. Unlike some of the fathers I don’t just let him win. I want him earn it, but that is a topic for a different post altogether. I recently had the opportunity to play Ga-ga for the first time in many years and was pleased to see that I am still a Ga-ga master.For those of you who are unfamilar with it here is a short description. “Ga-ga or GaGa is a form of dodgeball that is thought to have originated in Israel. “Ga” (×’×¢) means “hit” in Hebrew. 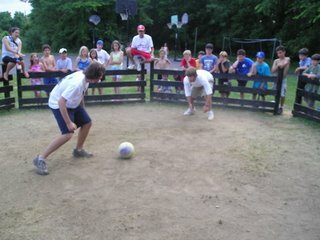 The game is popular at Jewish, American summer camps, many of which have special ga-ga arenas or so called “pits” in which to play. Some of my favorite memories are of massive Ga-ga games in which there were just tons of people in the court. Those were fast paced and somewhat physical games but ever so much fun.I always enjoyed playing a very physical game. I loved going after the people who would tap the ball off of the wall and try and stalk the other gameplayers across the court. I’d slide over to them and try to slap the ball away. Sometimes it would work and sometimes it led to an early demise, but no guts, no glory. During this most recent edition of Jack’s Ga-ga experience I was able to teach my son how play and tried to teach him some of the finer points of the game. He loved it and I loved watching him play. He still needs to work on learning how to lose gracefully, but at 5.5 that is not always an easy thing to do. He was also fortunate not to suffer a bad case of Ga-ga knuckles but if he is anything like me they are coming. In any case, it was nice to have a chance to play with him and watch him learn to enjoy something that I have had so much fun playing. I really enjoy Live Science because they come up with a slew of interesting articles. This particular article discusses NFL draft picks and their success or lack thereof. If you read through the article it discusses how the combine is not always a great indicator of success. Can’t say that I was surprised by that. Ezzie will probably be particularly interested in the section on cleveland which delineates the three factors that cause those teams to lose. Not to mention how it also translates to a huge disappointment for LeBron and company, but I digress. I recommend reading the article. But I’ll also add that I think that is more proof that few tests do a good job of really measuring how good people will be at anything. There are far too many variables that can influence performance. “But in a new study, Frank Kuzmits and Arthur Adams, professors at the University of Louisville, evaluated more than 300 quarterbacks, running backs and wide receivers drafted over six seasons from 1999-2004. They compared the players’ combine performance on seven physical tests and the WPT with measures of success in the NFL. These three skill positions were chosen as they have distinct performance statistics that can be tracked (as opposed to linemen or defensive players.) Each position used the success metrics of draft order, salaries for years 1-3 and games played for years 1-3. In addition, QB rating, yards per carry and yards per reception were measured for quarterbacks, running backs and wide receivers, respectively. No significant link was found between combine performance and NFL success, except between 40-yard dash times and running backs. Interestingly, even the Wonderlic aptitude test did not predict NFL achievement, even though a skill position like quarterback requires a decent amount of cognitive talent. That’s not to say other psychological tests would be worthless. Kuzmits and Adams cite other studies that show a player’s level of self-confidence and anxiety management to be strong clues to their future accomplishments. I thought that this was pretty cool. Somewhere my high school algebra teacher is smiling, more proof of math in the real world. “Years ago, physicist Seville Chapman proposed a model to explain how players manage the path of a fly ball so that they arrive to intercept it at just the right time. His theory, called Optical Acceleration Cancellation (OAC), used the acceleration of the ball through the vision field as a guide for player movement. As a fielder watches the ball rise, he moves either forward or backwards so that the ball moves at a constant speed through his field of vision. If he moves too far forward, the ball will rise faster and may eventually fly over his head. If he takes too many steps back, the ball will appear to rise slower and will drop in front of him. By managing the ball’s position with his movement, a fielder will end up at the right spot at the right time. This explains why the stationary fielders could not predict where the ball would land, as they did not have the benefit of OAC.If we ask real fielders how they knew where to run to catch a ball, they may not respond with, “Well, I simply adjusted my relative field position to keep the tangent of the vertical optical angle to the ball increasing at a constant rate.” So, to test the OAC geometric equations against real life, researchers led by Dinant Kistemaker of the University of Western Ontario, compared the predicted running paths from their mathematical simulation with the real running paths of fielders observed in a previous study.